Investment specialist Bill Browder says Russia is "essentially a criminal state"
Russia has now turned into a "criminal state", according to the man who was once its leading foreign investor. Bill Browder of Hermitage Capital was reacting to the news that his lawyer had died in prison in Russia after being held for a year without charge. 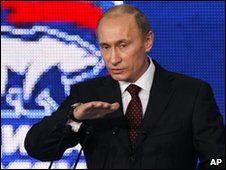 He told the BBC that his lawyer, Sergei Magnitsky, had in effect been "held hostage and they killed their hostage." Through Hermitage Capital, Bill Browder campaigned against corruption at some of Russia's largest companies. 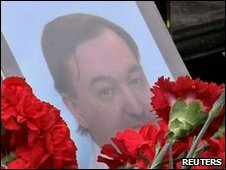 Russian officials say they are investigating Mr Magnitsky's death. In 2005, Mr Browder was banned from Russia as a threat to national security after allegations that his firms had evaded tax, but Mr Browder says his company was targeted by criminals trying to seize millions of pounds worth of his assets. Mr Browder says he was punished for being a threat to corrupt politicians and bureaucrats. Since then, a number of Mr Browder's associates in Russia - as well as lawyers acting for his company - have been detained, beaten or robbed. Before the accusations of tax evasion were raised, Mr Browder had for many years been one of the most outspoken defenders of the Russian government and its then-president Vladimir Putin. According to Mr Browder, Sergei Magnitsky developed stomach and pancreas problems in prison which were diagnosed by a prison physician. He says Mr Magnitsky was then moved to a new prison and deprived of medical treatment. "They basically said to him if you sign the following false confessions then we'll give you medical treatment - otherwise we won't," claims Mr Browder. Mr Magnitsky apparently wrote numerous complaints to the court, prosecutors and the prison authorities requesting medical treatment. Mr Browder says Mr Magnistky's pleas were first ignored and then denied. Mr Browder believes that Mr Magnitsky's death is a direct result of the tax evasion allegations against him. "They're trying to come up with any kind of charges they can against me and they were using him as their tool. He was their hostage and they killed their hostage by denying him medical attention, " he says. 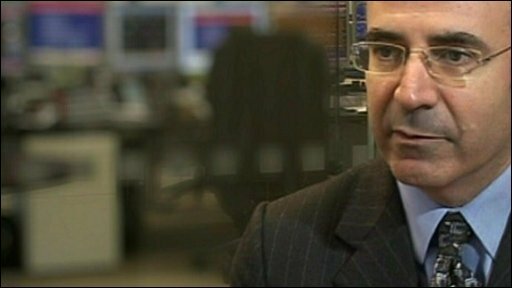 Sergei Magnitsky was one of the lawyers hired by Mr Browder to investigate whether fraud had been committed against his firms. Mr Browder alleges that when the police raided his office they took away corporate documents which they then used to steal his companies. "Sergei Magnitsky was one of the lawyers who discovered the whole crime, figured out who was responsible and then testified against the police officers - and after he testified against the police officers, the very same police officers had him arrested on spurious charges." The circumstances surrounding Mr Magnitsky's death have caused Bill Browder to question his attitude to Russia under Mr Putin. "When Putin first showed up and said he was going to tame the oligarchs, I was the biggest fan of that particular concept. Then I realised that what he meant by taming the oligarchs was sticking law enforcement people in their place," he says. "Now, you have a bunch of law enforcement people who are essentially organised criminals with unlimited power to ruin lives, take property and do whatever they like and that's far worse than I have ever seen in Russia before. Russia is essentially a criminal state now." Mr Browder says he is going to do all he can to get justice for Sergei Magnitsky. "We're not going to let it rest until the people responsible for the death face justice," he said. Responding to Mr Magnitsky's death, Russian Justice Minister Alexander Konovalov said he needed more evidence that the prisoner did not receive adequate medical care. "I would be grateful to human rights activists for providing specific information. In every case where there are doubts that assistance was timely and of good quality, there has to be a probe". The investigative committee for the Prosecutor's office said they were conducting a full investigation into the death. "As of now, we don't see a justification for starting a criminal case," said Moscow Investigative Committee chief, Anatoly Bagmet.